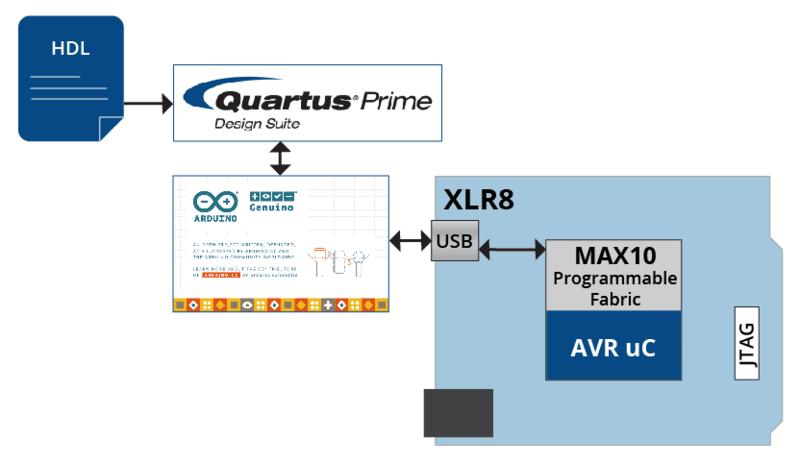 Although XLR8 was created to bring FPGA capabilities to the Arduino ecosystem, it is also a high quality, affordable option for FPGA designers. SUPPORTED by Intel Quartus Prime Lite Edition – FREE! $75 USD - Buy Now! If you are looking to develop your FPGA design from scratch, XLR8 gives you a familiar board design form factor. 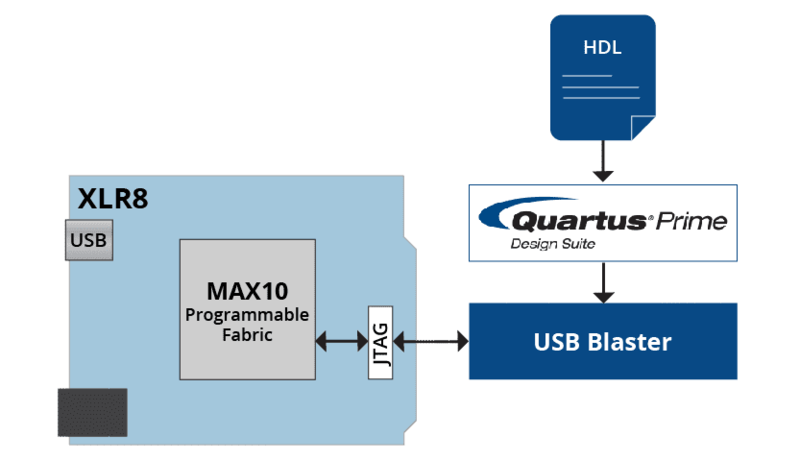 Just add a pin header, fire-up Intel’s Quartus Prime, and use USB Blaster to load your design to the MAX10 though the JTAG port. If you like the idea of keeping XLR8 Arduino-compatible, you can implement your FPGA logic in the form of Xcelerator Blocks and use OpenXLR8 to load them to the FPGA. This gives you the ability to program the MAX10 with your custom functionality across the USB interface on XLR8. No JTAG and No USB Blaster required! OpenXLR8 is the methodology that allows XLR8 users to create their own custom Xcelerator Blocks and integrate them into the FPGA. XLR8 ships with pre-installed XBs that target application-specific behavior. These are listed on the right. XLR8 can be field-updated to change the XBs implemented on the FPGA. Learn more about XBs on the Xcelerator Blocks page. Purchase your XLR8 board today! …a rather cunning drop-in replacement for an Arduino Uno with a twist. Although Arduino is an excellent platform for rapidly and inexpensively building new product designs, it is resource limited. 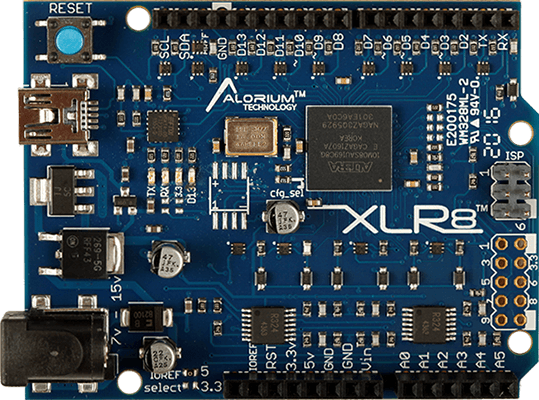 Alorium Technology’s XLR8 board solves this problem in a cost-effective manner by integrating an Arduino compatible processor into an FPGA with custom Xcelerator Blocks that significantly improve Arduino-based projects.